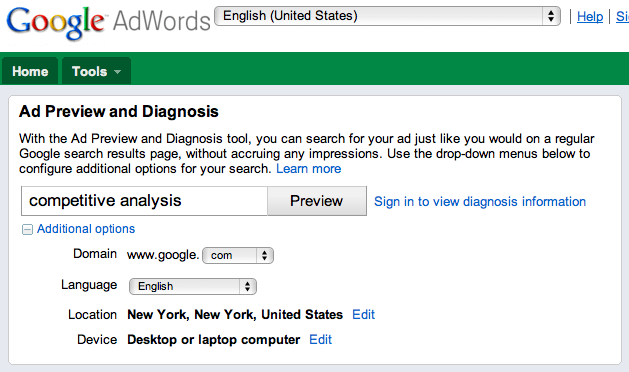 In this post I’m going to explain a nice way of jumpstarting your adwords campaigns using the Adwords Preview Tool. This process will allow you to take advantage of optimizations established advertisers have made over years of running their search marketing campaigns. While this technique can be augmented even further by using paid tools such as SpuFu, there is plenty you can do using Google’s Preview Tool. To start, type “preview tool” into Google and click on the first result. You will now be able to simulate a search on any of the Google top level domains, as if you were performing a Google search in a specific country. Testing and checking your ads without accruing impressions without clicks, which would negatively impact your Quality Score. Generated tested/proven ideas for your own campaigns by seeing what advertisers in other parts of the world are doing. The tool itself is self explanatory, be sure to choose the right country specific Google site, the right language, then the geography you would like to simulate being in. 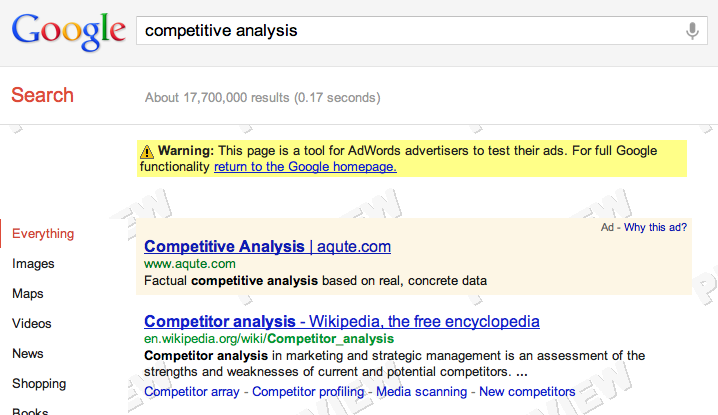 As you can see, there is only one advertiser bidding on this particular keyword! Try testing what similar advertisers to you are doing in various markets! Note their ads and test them against your own best performers. Don’t forget about other languages with the help of Google Translate too!